The soaring popularity of bourbon has resulted in high-end bourbon getting more and more expensive. Today, we’re ignoring the premium-priced whiskey and looking for some value bourbon options, both 100-proof Kentucky straight bourbons. Heaven Hill Bottled-in-Bond 6 Year Bourbon is sold only in Kentucky for the value price of around $13 a bottle. Made by Heaven Hill (who makes Elijah Craig and Evan Williams), it uses a mashbill of 75% corn, 13% rye, and 12% malted barley. It’s a standout because, while there are many bottom-shelf bourbons in the same price range, none carry an age statement of six years (meaning all the whiskey in the bottle has been aged at least six years). David Nicholson Reserve Straight Kentucky Bourbon Whiskey is also bottled at 100-proof, although it doesn’t carry an age statement. The brand was owned by the Van Winkle family until it was sold to Missouri-based Luxco in 2000. David Nicolson’s 1843 brand utilizes a wheated mashbill (as is the standard for Van Winkle bourbons), but the $30 Nicholson Reserve features a more traditional mashbill with rye along with corn and malted barley. Nose: Vanilla, brown sugar, burnt corn, citrus. Finish: Long with cinnamon and burnt sugar. Verdict: Just a solid, if unexceptional, classic bourbon. Good enough to sip neat, but perfectly priced and proofed for cocktails or other mixed drinks. Nose: Candied apple, spice, and leather. Palate: Plenty of spice and vanilla with apple and red fruit. Finish: Intense but short finish with fruit and spice. Verdict: Though not for everyone, this is a unique and largely enjoyable sipping bourbon. There’s a short sweetness that is enjoyable and can work in the right cocktail. In terms of price-to-value ratio, Heaven Hill Bottled in Bond 6 Year Bourbon is hard to beat, which is why it is a bourbon I try (despite being sold only in Kentucky) to keep on hand when I can. David Nicholson Reserve is more expensive, but also more unique. It’s worth a try, despite falling into a more competitive price range that includes such excellent bourbons as Eagle Rare 10 Year, Elijah Craig, and others. These are both versatile bourbons that pair with excellent cigars. 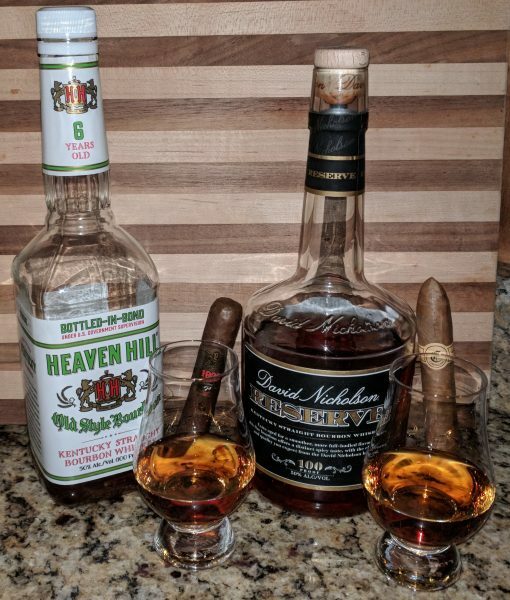 Heaven Hill Bottled in Bond 6 Year Bourbon pairs well with most balanced cigars, while the spiciness of David Nicholson Reserve is more apt towards a medium- to full-bodied cigar, like El Güegüense, Litto Gomez Diez Small Batch, Muestra de Saka, or Warped Futuro. The David Nicholson is a very nice moderately priced bourbon. I have paired it with medium to full bodied cigars, and it goes down smooth!